Ever since the end of October, the famed Ink Caves of the Writers' Study have been filled with even more work (and imps) than usual. Once again, the Yearly Awards are taking place, and the special ink used for inscribing the awards must be carefully prepared. Above ground, the Writers' Study Dining Hall gleams brightly, both from the many, many candles and also from the enthusiastic application of polish by the imps. They consider the highly-polished carpets to be a particular success, although Alwyn has insisted that warning signs be placed at strategic intervals, and some slightly less slippery rugs have been added to the Hall at the last minute, in an attempt to enhance the safety of the guests at this celebration. The Hall is filled with round tables, each surrounded by guests chatting happily. At one end of the room there is a long table, at which the Writers' Study staff are seated, with the Director, in full Content Director regalia (this year with new red embroidery entwined around the Content blue and Director's gold) in the central position. Director, writers, readers, my fellow Writers' Study staff and Writers' Study imps, welcome to the Writers' Study Yearly Awards Feast! At this signal, a swarm of imps appear from doors at the side of the Dining Hall, bearing trays of plates and bowls. There is, as you would expect, some confusion. Some of the soup has been served on plates, and one or two of the salads appear to have been mistakenly cooked, but eventually everyone has food of some sort. Happily, there is plenty to drink, both alcoholic and non-alcoholic. As everyone begins to eat, Caillagh continues. We had many nominees in this year's competition, which has given us an exciting and memorable contest. In the end, however, the ties were all broken, and so we can now announce this year's winners! We begin the presentations with our awards for Creative Writing of the Year. In third place this year is a collection of warm, engaging stories about family life - and cats. Congratulations to NorseThing, who has taken third place with Cat Tails. 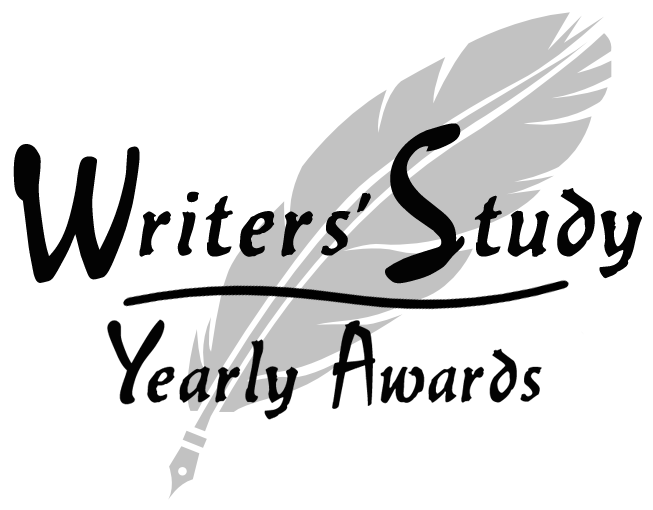 NorseThing receives 2 Writers' Study competition points, giving him a total of 11. In second place is an atmospheric tale of espionage and the approach of war. Our second-place winner is Basileos Leandros I's Swords Made of Letters. The award for second place is 3 WS competition points, so Basileos Leandros I now has 9 points. The winner in this category is another excellent piece of writing. It is another work in which war, politics and interesting characters feature, but this time set in a fantasy universe. Many congratulations to Admiral Van Tromp, whose Words of the Forgotten is our Creative Writing of the Year 2018! His prize is 4 WS competition points, which means he now has 17. Caillagh takes a large and impressive scroll from the table, and gives this to an imp waiting by the top table. The imp bows to Caillagh, and Caillagh bows in reply, and then the imp paces grandly to Admiral Van Tromp, bows again, and offers the scroll to the admiral. The imps have been busy throughout Caillagh's announcement and the presentation, and they are now bringing out plates and dishes heaped with food of all kinds - roast ham, enormous whole fish, great bowls of rice and platters filled with potatoes, stews of various kinds from around the world, pies, endless varieties of vegetable - the procession of imps seems never-ending. Each of the tables is supplied with an apparently random assortment of items for people to help themselves to while Caillagh, who is beginning to look at the food hungrily, continues to speak. Our next award is that for Best Newcomer. This year, the award goes to someone who has been active all across the Writers' Study. He has written both an AAR and his own Creative Writing, he has contributed to m_1512's Genesis of Empires, and he has also commented on the writing of other people. He has participated in the MAARC and the MCWC, and has entered (and won) Tale of the Week. There is absolutely no doubt that the award for Best Newcomer is very thoroughly deserved by this year's winner - Kilo11! As a category winner, Kilo11 receives 4 competition points, so he now has 17 in total. Caillagh hands a second impressive scroll to an imp. Once again, Caillagh and the imp bow to each other, and then the imp very solemnly processes across the Hall to Kilo11's table, where he presents the scroll to Kilo11 with another bow. Fights seem to be breaking out at some of the tables - particularly the one where the imps are sitting. It looks as though some people are refusing to share their favourite foods, and other people are objecting somewhat vigorously. Turkafinwë - looking very elegant in his Writers' Study gown embroided with blue quills and scrolls - strides determinedly over to the table and removes the dish of food that is causing the argument. On his return to the top table, Alwyn nods his approval and helps himself to the food Turkafinwë has brought with him. Last, but not least, we come to AAR of the Year Award. This year, this was a hard-fought category, with 14 nominees. In third place is an AAR set in the world of the crusaders, and told mostly from the point of view of a young prince. It has intrigue, and espionage, and - unsurprisingly for a Total War AAR - war. It is God's Justice by Swaeft. Swaeft receives 2 WS competition points, giving him a total of 6 points and a new bronze Writers' Study competition medal. Our second-place AAR is the dramatic tale of a curse - and of a great warrior - and of a chariot. It can only be The Last Chariots of the Tarquins by Skotos of Sinope. This gives Skotos 3 Writers' Study competition points, meaning that he has 5 in total. Caillagh's announcement is interrupted by the clattering of plates as the imps clear away the remains of the main course and bring out the desserts. The imps in the kitchen appear to feel that they have solved the problem of people arguing over different dishes - this time they have put a small amount of every kind of dessert into every single bowl. There is cake, and trifle, and rice pudding, and fruit, and apple pie, and what looks like some kind of suet pudding, all mixed together. The imps - clearly proud of their diplomatic genius - distribute these to everyone, place large jugs of cream and custard on each table, and then vanish back to the kitchen, chittering happily. As Caillagh makes the final announcement, the imps reappear to pour tea and coffee for those who want it. This year's AAR of the Year is the story of a faction. It tells us of the unstoppable rise of Carthage against enormous odds, and of the great leaders who made that rise possible. Congratulations to Alwyn, who has won with New Town. Alwyn receives 4 WS competition points, giving him a total of 25, which means he has earned a gold Writers' Study competition medal. Caillagh reaches for the final scroll, and clearly panics, for there is no third scroll on the table. As Caillagh looks around to see where it might be, an imp approaches and signals an offer of help by expressive ear-twitching. Caillagh nods in agreement, and the imp scuttles away to the kitchen, returning a moment later with the largest mug of coffee Caillagh has ever seen. Then the ritual can continue. Caillagh and the imp bow to one another - very carefully, so as not to spill the coffee. Caillagh gives the coffee to the imp. The imp gravely turns to Alwyn, bows, and hands over one of Alwyn's favourite things - a large cup of coffee. Congratulations to everyone who was nominated, and thank you to everyone who made a nomination or voted. Special congratulations, of course, to our winners! Congratulations to all the winners, and great to see so many entering. Thank you as always to the Writers Study team and the imps! I look forward to seeing more great writing from you all in 2019.